What's happening across the region! Here’s what our attendees said! The whole event was a huge success from my perspective as well as my colleagues who joined me, absolutely well worth their time. I don’t know if you received this feedback from others, but if I was a participant I would have liked to go to 2 of the breakout sessions since the topics were so great. Great keynote! Very useful information about current jobs, job growth, and supports need to ensure future success of current/future students. The keynote was both fascinating and mythbusting! Enjoy a hot breakfast and join other K-12 educators, university faculty, community programs, and business/industry representatives to explore what Career-connected learning means for our region. Connectwith business, in-school and out-of school educators, higher education partners, and regional STEM leaders. Learnabout the future of work in our region. What sectors will drive our economy in the next ten years? What high wage high demand jobs will be available to our youth? How do we prepare youth to be ready for those jobs? Exploreimpactful ways to connect industry to education. Christian Kaylor is a Workforce Economist for the Oregon Employment Department, specializing in the Portland area. He provides data and analysis relating to the Portland economy to local businesses, business associations and government agencies to facilitate intelligent decision making. Christian will share 10-year projections on Portland area high wage high demand jobs. How are future jobs in our region changing? Will our four major sectors -- healthcare, advanced manufacturing, construction, and technology -- continue to produce our high-demand, high-paying jobs? Dr. David Conley is Professor of Educational Policy and Leadership in the College of Education at the University of Oregon where he directs the Center for Educational Policy Research. He is the founder and president of EdImagine, an educational strategy consulting company. Dr. Conley is a national thought leader in the areas of college and career readiness, student ownership of learning, systems of assessment, social/emotional learning, and new models of educational accountability. Dr. Conley will present on the Future of Learning & Work. What is the future of learning and work? How do education and business work together to support career-connected learning? Register yourself today for free! Purchase an "Educator Hall Pass" ticket: Allow an educator to leave the classroom, enhance skills, network with colleagues, and attend STEMposium by covering the cost of a substitute for the day. Students and educators will benefit from your generosity! Sponsor a Table: Please consider supporting our regional STEM initiatives, including career-connected learning, by sponsoring a table. Bring colleagues or your employees for a day of learning and networking at STEMposium 2018! Make a tax-deductible donation of any size to Portland Metro STEM Partnership (see option on registration page). As part of our ODE STEM Innovation funding and in partnership with East Metro STEAM Partnership and South Metro-Salem STEM Partnership, we received funding to develop a STEM Leadership Academy for Administrators. The STEM Leadership Academy is envisioned as 12-month professional learning opportunity for school district administrators, specifically elementary principals and the district administrator who supports them. The goal of this experience is to deepen their knowledge and understanding of STEM teaching and learning through an Equity Lens so that they may more effectively support STEM education. 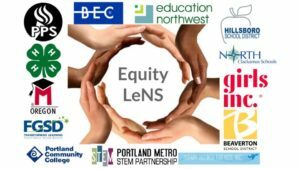 This opportunity would connect education leaders across three regional STEM Hubs (Portland Metro STEM Partnership, South Metro-Salem STEM, and East Metro STEAM Partnership) to learn broadly across key issues impacting elementary STEM education. We envision approximately 20-30 participants meeting approximately five times over the 12 months to learn together on topics and issues relevant to STEM education in the region, in their buildings and connected to issues of Equity. Topics may include how to increase time on science; effectively using evidence and data to drive classroom, school and program improvement; leadership approaches that support school transformation; and how to support ongoing, collaborative learning of teachers. 4th grade classrooms in Hillsboro during National Engineers Month. Oregon Connections is a web-based system that puts hundreds of local volunteers at educators’ fingertips. The program matches teachers with industry volunteers to set-up in-person classroom visits, facility tours, STEM Nights, career fairs, and more. Currently, Oregon Connections is the central mechanism driving a collaboration between the Portland Metro STEM Partnership, Hillsboro School District, and Intel. These partners have committed to bringing an engineer to every 4th grade classroom in the Hillsboro School District for National Engineers Month. Intel’s enthusiasm for the project is especially exciting. They have over 200 volunteers ready to head out into classrooms. While Oregon Connections simplifies the logistics of in-person, classroom visits for large projects such as National Engineers Month; it is just as effective at matching a volunteer to a single classroom for a visit. Here too it coordinates visit details, offers examples of successful interactions, and centralizes communication. Additionally, access to in-person interactions is free for all educators in Oregon. At its heart, Oregon Connections is a community of students, industry professionals, and educators that offers career inspiration to Oregon’s youth. Math in Real Life (MiRL) continues! MiRL is an ODE-funded collaborative professional development opportunity for teachers to develop and implement highly relevant applied math lessons for students in middle and high school. During the summer of 2016, math teachers in the Portland Metro area engaged in professional development that included site visits to businesses and research entities as well as access to expertise to experience and better understand applied math in real contexts. Then during the 2016-17 school year, teacher teams collaboratively developed applied math lessons informed by those experiences. Utilizing existing professional development learning communities, teacher teams piloted the lessons within their classrooms. Watch this video about one teacher team’s experience last year: goo.gl/cPF8gP. More focus on the implementation, adaptation, and revision of the existing applied math lessons with a focus on developing and refining the instructional strategies needed to support those lessons. Professional development will likely include topics on math discourse, math mindsets, and mathematical modeling as well as summer industry externships. A leadership development opportunity for teachers interested in supporting and engaging a team in a Lesson Study type process. This group will receive additional professional development on peer leadership, supporting math professional development, and facilitating peer learning. Expanded ways for teachers to participate including as an individual, as a member of a team, or as a leader of a team. Opportunities for non-math teachers to participate on a team; for instance, science teachers, CTE teachers, etc. A team does need to include at least one 7-10th grade math teacher. Are you a business or industry? Please consider hosting teacher externships! Externships are opportunities for small teams of teachers to see firsthand how math is used in local businesses and industries. By seeing and experiencing authentic workplace applications of mathematics, teachers will be better able to help students connect “classroom math” to real-world, applied math. An ideal MIRL externship would include a variety of experiences during which teachers would learn useful new ways to apply mathematics and lead to a lasting relationship with one or more industry partners. Externships take place in the summer (usually July) and provide approximately 15 hours of experiences for the team.